Belmont Chorale, led by Conductor and Professor in the School of Music Dr. Jeffrey Ames, hosted a joint concert with “Souls of Seoul,” a semi-professional choir from Seoul, South Korea, on Tuesday, February 20. Led by Jihoon Park, the Souls of Seoul choir, known as SOS and with a tagline of ‘Saving our Souls,’ is made up of 47 traveling vocalists. 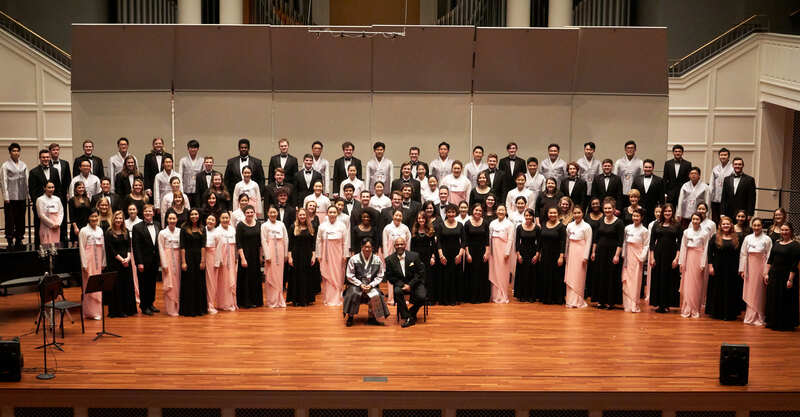 Ames and Park met in 2016 when they were selected to participate in the American Choral Directors Association’s International Conductors Exchange Program. As part of the program, Park visited the US in March 2016 for two weeks and spent time in Los Angeles and Nashville, participating in conferences, facilitating workshops and hosting lectures for Belmont students. Months later, in July, Ames visited South Korea for two weeks and spent time working alongside Park and SOS. Tuesday night’s joint performance included individual performances by both choirs, as well as combined pieces. The night ended with Park introducing SOS’s goodbye song to Belmont Chorale, a piece they sang in English and then finished in Korean. Chorale completed the event by singing an Irish blessing that was first read aloud in Korean by Belmont student musician Christine Chong.